Murphy’s course for first-years, Are We Alone? The Fermi Paradox, refers to the contradiction between the high likelihood of the existence of extraterrestrial life and the complete lack of evidence for it. In the next 15 years, Murphy expects to see research indicating that Earth-like planets are common in the universe. 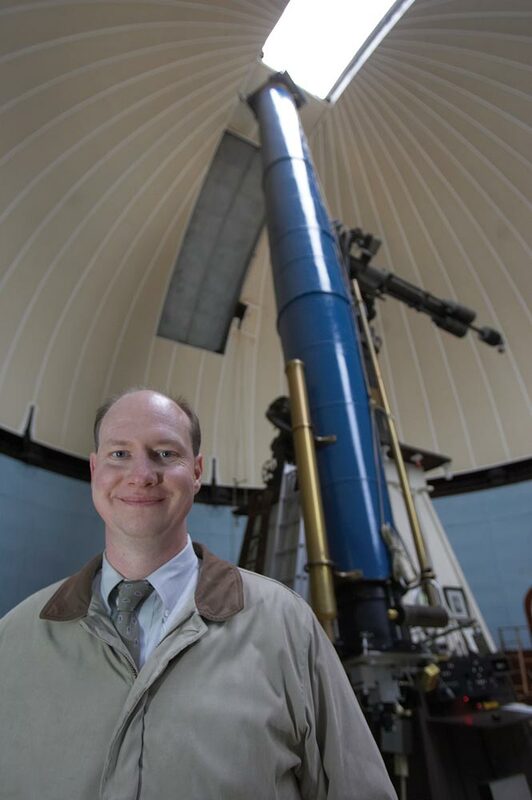 Although it may seem like a lofty expectation, Murphy insists it isn’t, because astronomy advances so rapidly. “Fifteen years ago, we only knew of nine planets. We assumed other stars had planets going around them, but we had no way to detect them. Now, we’ve discovered more than 500 planets going around other stars. Atoms are the basic unit of matter, constituting everything in the universe, from the stars in the night sky to our own fingertips. “Have you ever stopped to consider the origin of those atoms, the oxygen and carbon that make up your body?” asks Murphy. Atoms’ building blocks—protons, neutrons, and electrons—have existed since the birth of the universe, 13.7 billion years ago. But how did they get here? Just after the Big Bang—a term that was coined sarcastically by cosmologist Fred Hoyle to describe the birth of the universe—atoms were all fairly simple. All that existed were light gases such as hydrogen, helium and lithium. Life as we know it—from amoebas to zebras—requires heavier, more complex atoms, which have not only more orbiting electrons but also more protons and neutrons inside their larger nuclei. “As massive stars live out their lives, they fuse hydrogen atoms into helium atoms. Near the ends of their lives, they fuse helium to carbon, then carbon to oxygen, and then other reactions occur, synthesizing ever heavier elements until they reach iron,” says Murphy. Thus, these stars transform light elements into heavier elements such as the carbon in your DNA and the nitrogen and oxygen that you breathe. Iron is the most stable element in the periodic table. Producing elements more massive than iron requires tremendous temperatures. A supernova—a giant imploding star—produces temperatures greater than 10 billion degrees. “In the few seconds that it takes a massive star to implode at the end of its life, all the elements heavier than iron are created,” says Murphy. The energy released in the implosion throws off the outer layers of the star, now enriched in these heavier elements. About 4.6 billion years ago, in a little corner of the Milky Way, swirls of dust grains and gas began to coalesce into our solar system. A giant’s share became the sun—99.9 percent of atoms in our solar system are part of the sun. The small portion left behind included particles of dust and ice that kept colliding and fusing together over and over, creating the planets, asteroids and comets of our solar system. Since the Big Bang, the atoms in your body have been inside multiple generations of stars. “The next breath you take will expel some of your atoms into the air, and these atoms will become part of something else, a raindrop or blade of grass,” says Murphy. As our sun dies, about 5 billion years from now, it will become a red giant star. The Earth will be heated such that the outer layers will evaporate off into space, and these atoms will again be in the interstellar medium. Eventually, these atoms will become part of another star. And on the cycle will go.